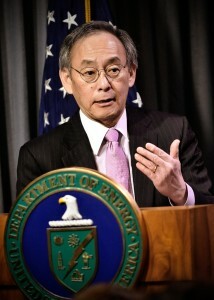 WASHINGTON — U.S. Secretary of Energy Steven Chu has announced his decision not to serve a second term. The Nobel Prize winner is one of three Asian Americans who has served in the Cabinet during President Obama’s first term, along with Secretary of Veterans Affairs Eric Shinseki, who will remain at his post, and Secretary of Commerce Gary Locke, who was appointed U.S. ambassador to China. “Serving the country as secretary of energy, and working alongside such an extraordinary team of people at the department, has been the greatest privilege of my life. While the job has had many challenges, it has been an exciting time for the Department, the country, and for me personally. “This is the approach I’ve brought to the Department of Energy, where I believe we should be judged not by the money we direct to a particular state or district, company, university or national lab, but by the character of our decisions. The Department of Energy serves the country as a Department of Science, a Department of Innovation, and a Department of Nuclear Security. “I have worked each day to move the department in a direction where the political leadership and highest levels of career managers have the intellectual curiosity and wisdom to learn from the people who reported to them and where the subject matter experts — which should include managers at the highest levels — as well as employees at our national laboratories welcome their counsel and help. “I grew up and matured in organizations where a graduate student or staff scientist could have a discussion with a company department head, a professor, a national lab director and be heard, not because of their rank in the organization, but because of the quality of their ideas. “The president announced an EV Everywhere Challenge, with the goal to achieve plug-in hybrids or EVs with a 100-mile range at the same cost of owning and operating a comparable sized internal combustion engine car with 40 miles/gallon for five years. “The batteries developed for plug-in EVs will also revolutionize the electrical distribution system and the use of renewable energy. Wind energy is already expected to reach grid parity in less than a decade. Unless we develop new business models with utility companies and other stake-holders, we will not be able to take full advantage of the accelerating pace of technology. “We’re also forging stronger partnerships with industry to give America’s innovators and entrepreneurs a competitive edge in the global marketplace. We have held workshops with industry in materials, computation, solar PV, plug-in electric vehicles, and many other areas to actively engage companies to take better advantage of the department’s capabilities — from our extraordinary user facilities to our scientists and engineers. “In the last four years, the production of clean, renewable energy from wind and solar has doubled — driven in part by our administration’s investments in the development and deployment of the latest technologies. Installations of solar photovoltaic systems have nearly doubled in each one of the last three years, exceeding 1.8 gigawatts in 2011. According to AWEA, last year 42 percent of new energy capacity in the U.S. was from wind – more than any other energy source. “In addition to our approximately $25 billion annual budget, we were entrusted by Congress to make a $36 billion investment through the Recovery Act to help ensure that the clean energy jobs of tomorrow are being created here in America today. And we made this investment with a robust review process that brought a new level of expertise from inside and outside the department to ensure that decisions were based on the merits of each applicant. “Through the Recovery Act, the Department of Energy made grants and loans to more than 1,300 companies. While critics try hard to discredit the program, the truth is that only one percent of the companies of the companies we funded went bankrupt. That one percent has gotten more attention than the 99 percent that have not. “After the Fukushima Daiichi nuclear meltdown, other teams of DOE scientists, engineers, and emergency responders acted with admirable competence, commitment and composure. “Our nuclear security teams have removed 1,340 kilograms of highly enriched uranium and 35 kilograms of plutonium from vulnerable sites throughout the world — enough material for approximately 55 nuclear weapons — including cleaning out eight countries of all highly enriched uranium. “The president secured ratification of the New Start Treaty, under which the U.S. and Russia agreed to further reduce the number of deployed warheads to lowest level since the 1950s – an 85 percent reduction from the darkest days of the Cold War. “And over the last four years, we have worked with our partners to downblend more than 100,000 kilograms of weapons-grade uranium from the former Soviet Union, converting it to peaceful purposes like U.S. civilian nuclear reactors. In fact, roughly 10 percent of America’s electricity comes from uranium that once threatened the United States as part of the Soviet nuclear arsenal. “We made historic progress in cleaning up nuclear contamination left over from the Cold War, reducing the total footprint by nearly 75 percent and permanently cleaning up 690 square miles of contaminated land — an area more than 30 times the size of Manhattan …. “I want to conclude by making a few observations about the importance of the Department of Energy missions to our economic prosperity, dependency on foreign oil and climate change. “The United States spent roughly $430 billion on foreign oil in 2012. This is a direct wealth transfer out of our country. Many billions more are spent to keep oil shipping lanes open and oil geo-politics add considerable additional burdens. Although our oil imports are projected to fall to a 25-year low next year, we still pay a heavy economic, national security and human cost for our oil addiction. “The average temperature of our planet is rising, with majority of the temperature increase occurring in the last 30 years. During the three decades from 1980 to 2011, the number of violent storms, floods, droughts, heat waves, wildfires, as tabulated by the reinsurance company Munich Re, has increased more than three-fold. They also estimate that the financial losses follow a trend line that has gone from $40 billion to $170 billion per year. “While we cannot accurately predict the course of climate change in the coming decades, the risks we run if we don’t change our course are enormous. Prudent risk management does not equate uncertainty with inaction. “Our ability to find and extract fossil fuels continues to improve, and economically recoverable reservoirs around the world are likely to keep pace with the rising demand for decades. As the saying goes, the Stone Age did not end because we ran out of stones; we transitioned to better solutions. “The same opportunity lies before us with energy efficiency and clean energy. The cost of renewable energy is rapidly becoming competitive with other sources of energy, and the department has played a significant role in accelerating the transition to affordable, accessible and sustainable energy. “Serving as secretary of energy during such a momentous and important time has been incredibly demanding but enormously rewarding. I’ve been continually impressed by the talent and commitment of the men and women of this department. “While I will always remain dedicated to the missions of the department, I informed the president of my decision a few days after the election that Jean and I were eager to return to California. I would like to return to an academic life of teaching and research, but will still work to advance the missions that we have been working on together for the last four years. “In the short term, I plan to stay on as secretary past the ARPA-E Summit at the end of February. I may stay beyond that time so that I can leave the department in the hands of the new secretary. “The journey that I began with you four years ago will continue for many years. I began my message talking about my vision of what I wanted to do with the department. Some of those goals have been realized, and we have planted many seeds together. “Just as today’s boom in shale gas production was made possible by Department of Energy research from 1978 to 1991, some of the most significant work may not be known for decades. What matters is that our country will reap the benefits of what we have started. To see the entire letter, visit http://energy.gov/. This is the most erudite, sensible, and clearly-expressed piece of writing from anyone who has been or is in the government that I know of. Too bad he won’t be around four more years. His accomplishments are significant on many levels.